In every parent’s life, there comes a time dedicated to the unpleasant: we ditch bottles for bowel movements; let’s get this potty started! Unfortunately for you (and good for the detergent industry), children don’t take to the toilet the way kittens take to litter. But, they also don’t poop in boxes. So, at least that’s a bonus. Every kid potty trains at different rates. Just because your sister’s kid potty trained in thirty seconds (or so she says), that doesn’t mean you’ll have the same experience. The best way to potty train is to not have any expectations in the first place. Potty training isn’t easy and accidents are sure to try the patience of everyone involved. But attempt to practice serenity. Some children test you by refusing to use a toilet – don’t show them that their defiance is working. If they poop and pee all over, keep your temper in check. You don’t want to scare them into constipation. Some kids won’t use the toilet for very specific reasons – they might be scared of something or they might have had a bad experience. If your child’s refusing to go, ask them why. The problem could be quite simple to fix. Needing to use the bathroom might be annoying, but it’s natural. Teaching kids this helps them understand the inherent necessity. But, don’t only teach them that all humans have to go, use your pets too. Show them your dog’s toilet (i.e., the backyard) and explain the process. You may also take this opportunity to let them know that yellow snow is not lemon-flavored. When you first start to potty train, it’s easy to forget about the importance of routine. Diapers didn’t need consistency: when they were dirty, you changed them. But toilet training requires doing the same thing over and over again. Using a timer not only reminds you to encourage your child to go, but it also cues the kid as well: they hear a chime and they know it’s pooping time. Your children see you as a super hero when they’re young – they value your opinion. If you’re disappointed in them, they work to amend the situation. Use this to your advantage: laud them for using the loo, and express sadness when their underwear fills up with poo. There are two wonderful things that come with toddlerhood: a) your child is willing to fetch things for you (a can of soda or the remote control) and b) they are motivated by rewards. The latter is handy with toilet training. A jar of jelly beans or M&Ms goes a long way. Still, beware of manipulation: your child pretending to go in order to get the goods. Thus, reward when they actually do something – pay only by the drop or plop. Kids like to have fun; kids should have fun. After all, that’s the beauty of childhood. When you bring this fun into the bathroom, children are more receptive. They no longer view the toilet as something less convenient than diapers. Rather, they view it as joyful. So get creative – write a story about the toilet that couldn’t stop flushing, sing a song about toilet paper lost at sea, juggle bars of soap. Often, kids look at regular toilets as if they’re monsters determined to swallow them whole. Using a child sized toilet fixes this fear – if it has cartoon characters, that’s even better. For a fast cleanup, consider lining the toilet with coffee filters. Just don’t use them to make coffee afterwards. Some kids need a toilet with handlebars and allowing them to sit backwards provides this. They’re able to grab onto the lid and hold on for the ride. Little boys are sometimes harder to potty train than their female peers. Allowing them to aim at something – a Fruit Loop, a Cheerio, a torn up photograph of your ex-flame – provides motivation, hopefully assuring a quick study. Allow your kids to decorate the toilet in any manner they want. Make it a throne, a castle, or a rocket ship. Do whatever you need to do to help the toilet appear as welcoming as possible. Kids like to feel important and being the person who determines the color of the toilet water is highly important! So, use food coloring or color tablets to turn the bowl to any color they want. Hopefully, the water will be brown in no time. For every child who uses toilet paper, fourteen trees die in the process. Simply put, your child uses wads and wads of toilet paper if you let them. Limiting their access saves money, saves the environment, and saves you from having to call a plumber after every high fiber meal. If the pride you feel for your child isn’t enough to entice them to go, bring in reinforcements. You don’t have to solicit your neighbor – Hey Henry, come see what’s in our toilet – but give your child an audience they can relate to: their stuffed animals, their dolls, or the family dog. Many children respond better when they see their progression. A chart that tracks how well they’re doing offers the inspiration they need to push themselves. Days without an accident: 3.5. Even when a child becomes potty trained during waking hours, the nighttime urges are harder to quash. Waking your child up in the middle of the night and forcing them to go is one way to avoid this. Tragically, this also involves you waking up. So maybe just stock up on overnight diapers instead. As mentioned above, rewarding your child with gifts is always effective. But the element of surprise adds a little extra kick. For one thing, your child won’t know what they’re getting, priming their curiosity. For another, their imagination of the possibilities is often enough to lure them to go again and again. Who knows, maybe that surprise is a pony. Kids and adults possess different goals: your goal is to get them out of diapers; their goal is to be rewarded. Agreeing to a grand finale present offers a tangible goal which enables them to strive. You might agree to buy your child a doll house or a remote control car but only after they’re fully potty trained. Don’t give in before; that defeats the purpose. 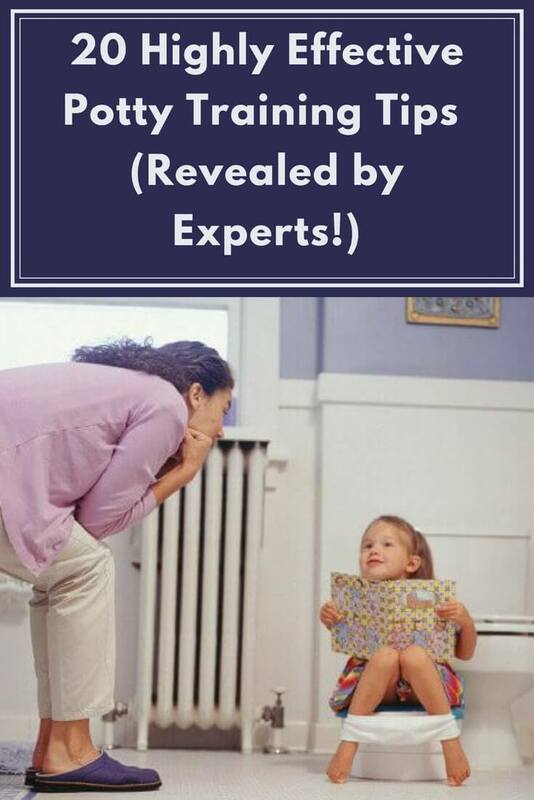 There are all kinds of how-to books that offer advice on potty training. These are fine for you, but boring for your kids. Instead, find a children’s book that talks about why using a toilet is important. Read it with your child as often as you need to. Let them read it while sitting on the potty too. Potty training is a marathon, not a sprint. Your child will get there eventually, but the above potty training tips make the process a little smoother. At the very least, they’ll certainly get things flowing.